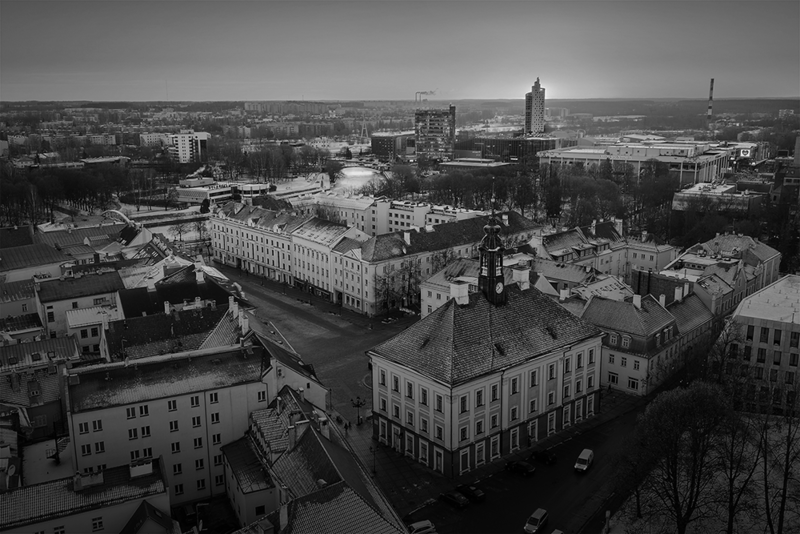 Tartu is the only city in the world which is in the word ‘sTARTUp’. 2018 was a remarkably successful year for Tartu’s ecosystem. Both, the community of Tartu and it’s members have been noticed and recognized. For startups, this past year was successful thanks to different fundings and collaboration projects. The highlights of the community were unitedness and initiative. furnishing retailer Ingka Group, which operates 367 IKEA stores, SEB Alliance, Y Combinator and Yunqi VC. The aim of this investment is to expand and accelerate Click&Grow representation in the world and popularize hyper-local gardening. Out of early-stage startups, eAgronom flew high and raised additional million euros from their clients. eAgronom has raised a total of 2 million euros by now. Robin Saluoks, Co-Founder and CEO of eAgronom was rewarded with Young Entrepreneur of the Year award during an award gala which took place on October 4th. Last year winners have been Testlio’s founder Kristel Kruustük and Taxify’s founder Markus Villig. Another early-stage startup Fractory.co, was also successful and raised 170 000 euros from EstBAN's Nordic Angels Program. 34 angel investors from Estonia, the Netherlands, Belgium, and Saudi-Arabia participated in the syndicate. Fractory.co was also highly acknowledged in fall, when it was chosen to be the best startup at world’s biggest industrial exhibition EuroBLECH in Germany. Out of science-based enterprises, London based startup Realeyes was triumphant and raised 16,2 million dollars in spring. Although Realeyes is not really a startup based in Tartu, they have collaborated with the University of Tartu experimental psychology laboratory, which is a good example of collaboration between the academic and business world. The award for the biggest product launch of the year goes to Nevercode, who in collaboration with Google launched a new product Codemagic, which is the first tool specially designed for Flutter apps for continuous integration and supply (CI/CD). This product was completed mostly undercover and everyone was surprised when Nevercode’s CEO and co-founder Triin Kask got onstage during Google’s major event Flutter Live to introduce Codemagic. 3CULAR was chosen as one of the TOP 10 finalists out of 135 startups at Climate Launchpad in Edinburgh. Tartu was represented at the biggest Estonian entrepreneurship competition Ajujaht finals by Decomer Technology and Z Basket. In Top 30 there were 12 teams from Tartu: Easy Sample, SmartVent, PowerUp Fuel Cells OÜ, Festera, Tubly OÜ, Makerlab engineering complexes, Triumf Health, 3CULAR, Festplate and Juice³. sTARTUp Talks, the official side event series of sTARTUp Day was launched with sTARTUp Gaming. The event that brought together the gaming industry. In November, a conference focused on AI took place. Tartu was represented for the first time at Techstars Startup Week Tallinn program, where a nice fireside chat took place with one of our most successful early-stage startup Fractory.co founder Martin Vares. The biggest recognition of the year for our sTARTUp community was the “Collaborators 2018” award from Startup Estonia, which was given out during the last community meeting of the year in Tallinn. We love Tartu and developing our sTARTUp ecosystem here – it feels so good to be noticed outside of our community as well! 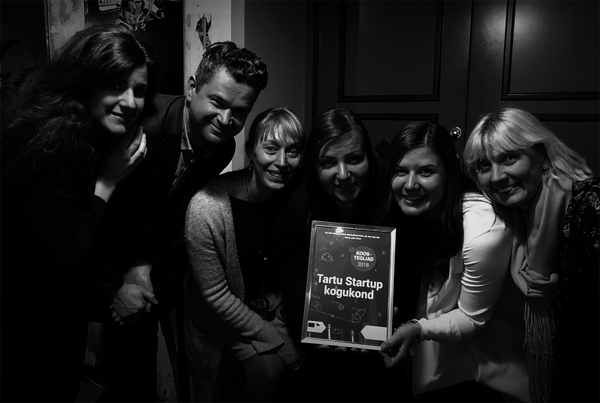 sTARTUp day has contributed a lot to the startup ecosystem of Tartu, development. This event is organized by NGO sTARTUp Day, which includes eight different organizations: city of Tartu, University of Tartu, Tartu Science Park, Tartu Centre for Creative Industries, Tartu Biotechnology park, Tartu Business Advisory Services and .Contriber. A remarkable event was the change of NPO’s role at the end of 2018: according to statute, the main activity for the organization was organizing sTARTUp Day’s business festival once a year. Starting from this year, the main goal of the NPO is to develop sTARTUp community as a whole and a sTARTUp community leader is hired to work full time as a coordinator of the community’s work. To end, it would be fitting to bring out sTARTUp's city map created by Jaak Vilo as a new year’s greeting. 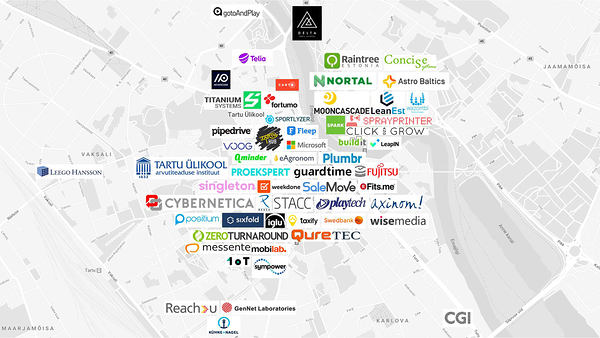 In this map, all the most important startups and IT companies are represented. We all work to have even more awesome startups on that map in 2020!